I’d like to present to you one of the skateboards from SPOKEY. Let’s have a closer look at the RENEGAE model, we’ll assess its parts, check who it suits best and is its price adequate for the quality you get. 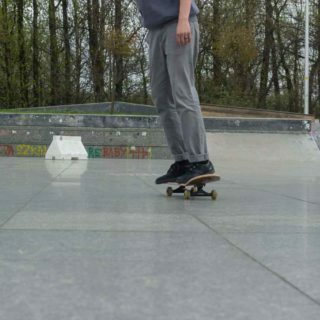 The skateboard is aimed at beginners. 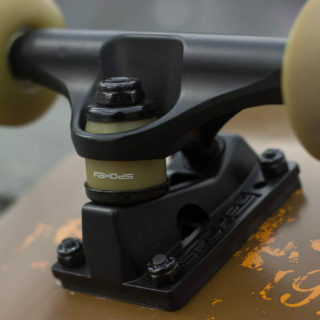 When buying your first skateboard we should mainly pay attention to the trucks and wheels. These are parts which wear the least and can serve us for a much long period of time than the deck or bearings. Let’s be honest though, most of us looks at the price first. That’s not a bad thing, obviously buying a skateboard as a present for a child there’s always the chance that it will be thrown in the corner. The price spread of skateboards is very big. 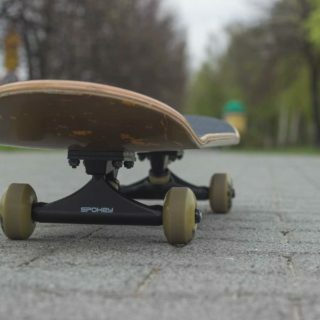 In retail stores you can find skateboards for as little as 70 PLN, however in specialist shops with skateboards you can put together a skateboard for 1000 PLN. At a glance, each skateboard in a store looks the same and you’re not able to check the differences in the store or take it for a ride. 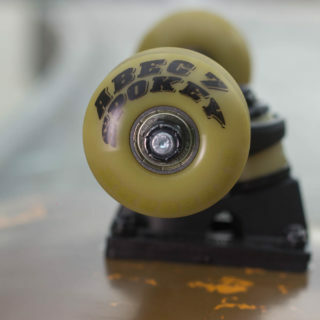 The Spokey RENEGADE skateboard can be found in stores for approximately 200 PLN. The price is very appealing so let see if it fulfills the expectations of beginners. 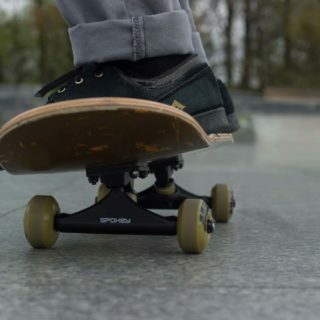 On your first skateboard you have to learn how to skate off, turn, ride down obstacles, start to learn how to ollie on a flat surface, that’s why it is very important how the skateboard behaves while just being ridden. 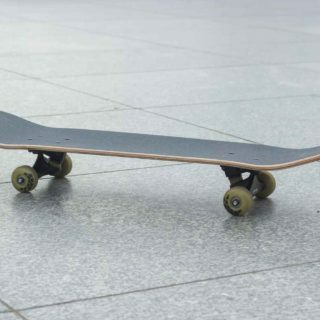 How a skateboard turns is governed by its trucks, so the metal parts screwed to the deck. The trucks include rubber elements and its these elements provide the appropriate turning ability. 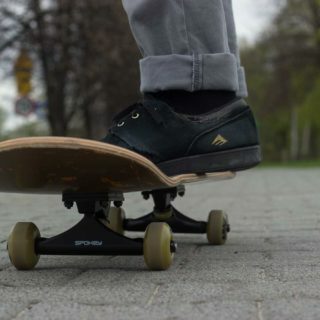 In our skateboard there are rather soft rubbers thanks to which even small children can perform turns shifting their balance from their toes to their heels. Trucks in this model fulfill their role, let’s give them a thumbs up. I thought there would be problems when a adult steps onto the skateboard – someone weighing more than 50-60kg. Often is tighter turns by heavier people, the wheel can touch the deck which subsequently causes sudden breaking. 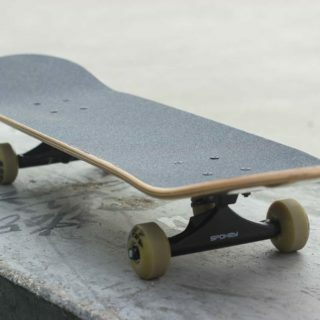 However, this model is fitted with rather tall trucks and additional washers, thanks to which the distance between the wheel and the deck is greater, the skateboard rides and turns smoothly. The wheels determine the speed and smoothness of our ride. Sometimes it is not possible to check their condition in the store and we have to buy the skateboard not knowing what we’re buying. Obviously there are some signs which don’t tell us much and may not have anything to do with the truth. In this model though we haven’t been lied to. I would rate the wheels as medium hard and this is in line with what the manufacturer provides in his specification (hardness 95A). 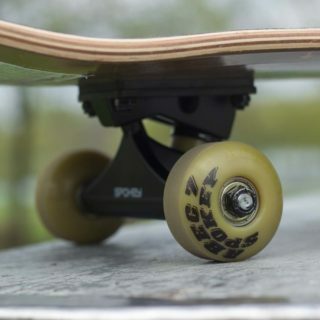 Soft wheels for longboards have a hardness rating of 80A however hard wheels used for riding in a skatepark are rated over 100A. Choosing such a hardness is understandable for me. These wheels will work well both on uneven surfaces (concrete pavers) and skateparks with a hard flat surface. 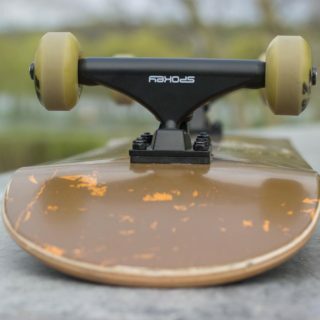 Obviously wheels with a hardness of 101A will ride faster at a skatepark but on a skateboard for a beginner it’s good to have something in between and be happy with the ride on various surfaces. The bearings mounter in RENAGADE model are very popular in skateboarding. It’s not the highest class of bearing, but believe me that in comparison with some other models, which you can find in retail stores, which after pushing away once you can barely ride more than a couple of meters, these are very good. In this model the bearings fulfill their role and I think that at the beginning we don’t need anything more. Remember, that in skateboards the bearings are not protected in any way, as a result they are subject to dirt and water. You have to count on the fact that, if we are going to ride in dirty places, with dust or we ride in through water, our wheels may stop spinning easily. As I wrote at the beginning, the most important part in your first skateboard are the trucks and wheels. We shouldn’t pay too much attention to the deck. 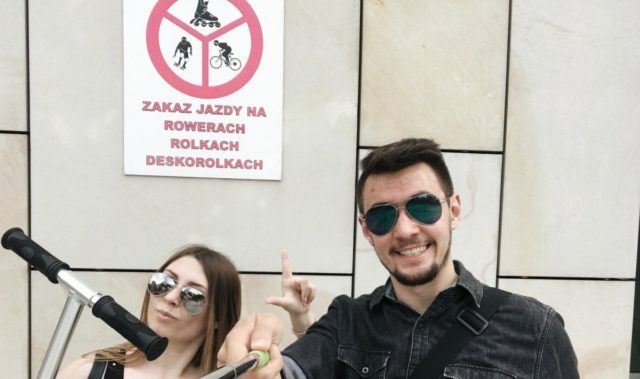 If we are buying a skateboard for 200 PLN we have to be aware that professional decks for doing tricks cost in the vicinity of 180-300 PLN and even they break. So we can’t expect that our first skateboard will serve us for our entire life. 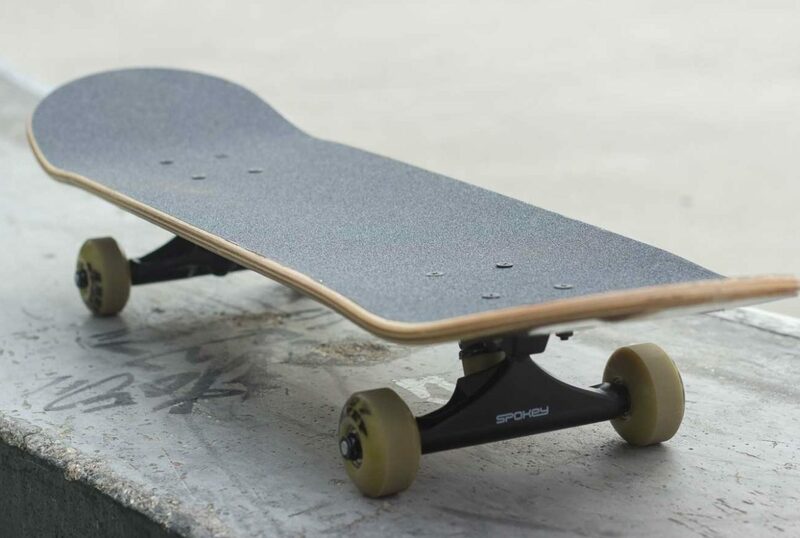 The deck from Spokey at first glance looks just like every other deck, however its intended use means it’s not as durable as a professional one. 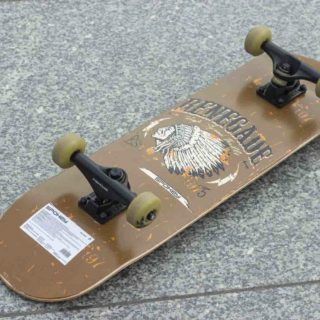 Its shape is similar to a standard deck however with minor differences to the decks I ride on each day. All the bends and cut outs in the deck are there to aid in performing some tricks, remember though that they won’t be necessary when we are just starting to try skateboarding. 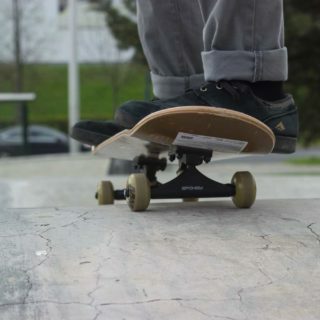 The whole skateboard stacks up well during riding and performing basic maneuvers at a skatepark. Also it’s nice to ride on concrete pavers thanks to the soft wheels. However it didn’t survive the test of jumping down stairs, its delaminated very quickly. My assessment of the Spokey Renegade skateboard is very much a thumbs up. I would recommend it to people who want to start skateboarding. 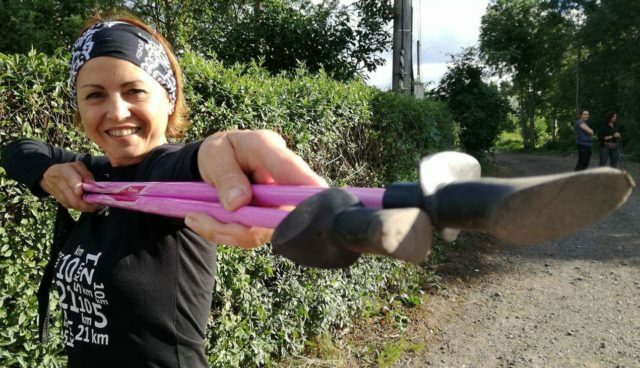 At this price it’s hard to find a better product which is suitable for beginners.